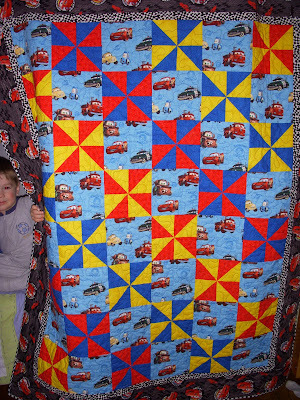 I finally finished Patch's Cars quilt this week. He was very excited, although not thrilled with my thread choice. I used a black/grey variegated thread, and he thought it made Lightning "dirty." Oh well. And here is the back. Can I share a secret? My least favorite part of quilting is piecing the back. Ugh. Such big pieces of fabric. So impossible to iron. Not to mention the fact that I never get them square (which means even sides). I linked up on amylouwho's blog. Go check out the other projects! This weekend, we crafted. 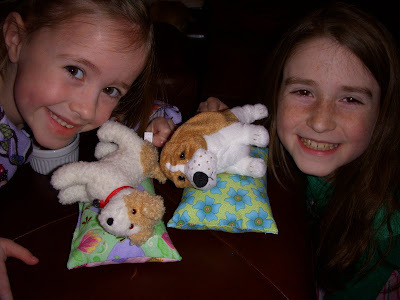 We made beds for the American Girl dogs. 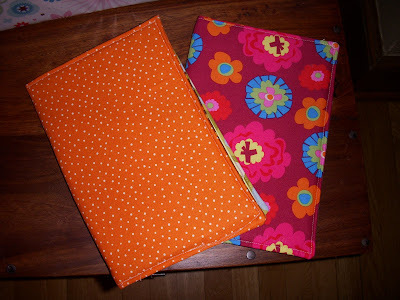 The girls got to pick their fabrics, I did the cutting and sewing, and the girls did the stuffing. I think if we were to do this again, I would tweak the pattern a little. Maybe I will revisit this. Eh, I probably won't. 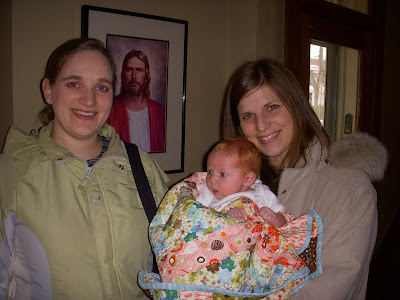 a baby quilt for Ginger. There are a couple of things that make this awesome. First, Lauren is pregnant with two small kids, and Colleen, who probably wishes she were pregnant, has 3 small kids. Quilting takes some time, my friends, which they don't have much of. 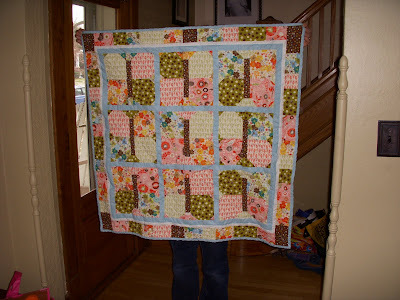 Second, it's the first time anyone has made me a quilt. 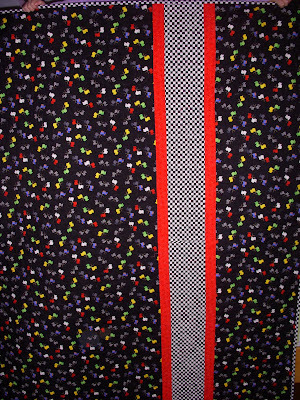 Third, while on the phone with Lauren, I told her of this awesome fabric I had seen in the store and really wanted a reason to buy. This quilt is made from that fabric. Do they know me or what? Ginger really likes it. 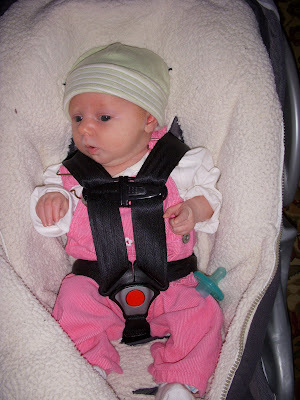 We took it to the YMCA during Mini-me's ballet class, and it received many compliments. Ginger is now one month old. Her hair is growing, as is her body. She still isn't sleeping through the night, but she does the best she can. Her eyes are blue as can be. And sometimes, she smiles. Patch and Mini-me have become more independent. They can now get their own breakfast. It's great for days with no school when I need a little extra sleep (like this morning). Tomorrow, Ginger will be four weeks old. She still has all of her hair. In fact, she has more of it. She eats like a champ. She is fighting thrush, but it's a tough thing to beat. Ginger is such a charmer, she's even brought Patch around. He "wuvs" her. Is being this cute even allowed? It can't be. 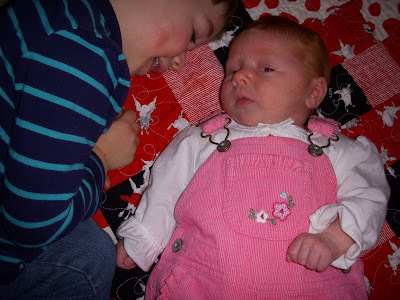 I have hit the cuteness jackpot with my kids. I know most people think that about their own kids, but in my case, it's true. I have a feeling the next four weeks are going to go by just as fast. Pretty soon she'll be sassing me like the others. I have goals -- a lot of them. I have found that, in the past, the more specific I am about my New Year's goals, the more chance I have of actually achieving them. So, I have moved away from the "lose weight" and "be more spiritual" type of goals, and have some concrete things I want to have done by the end of 2010. Be 2 sizes smaller at Sun Valley than the last time I was there. I really don't think that realistically I can be at my goal weight in 6 months, but I know if I work hard, I can be 2 sizes smaller by July. For me, that's about 40 pounds to lose. Complete one quilt a month. This can be anything, from finishing up those UFOs, to starting something new. 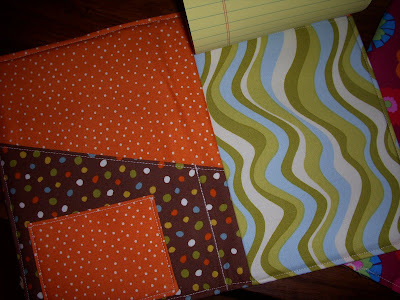 I have yet to start on Ginger's quilt. Oops. Family scripture study every day. We have started on this, and it's going great so far. We read just one verse a day. Mini-me loves to be the reader. Patch is as distracting as he could possibly be. Flower isn't with us every night, but my goal for her this year is to learn to love the Book of Mormon as much as she loves the Bible. On a side note -- Curly and I have started reading the Book of Mormon together. Unfortunately, I have yet to stay awake as he reads. Oops. Eat out only once per week, unless we are travelling. This one will be hard, because I love to eat out. I think our budget will thank me. I need to be better about packing a lunch for Curly, too. Those $5 lunches add up! Cinnamon Roll Monday. This was an idea I had a couple of months ago. I actually read about something similar in a book. The character would make 3 pies every Sunday; one for her family, and then two for people she felt inspired to give them to. I'm not sure I can do a weekly batch of cinnamon rolls -- maybe just once a month. What I do know is that when I did it before Ginger was born, I really liked thinking about those who I know who might need a little extra love in the form of baked goods. Anyway, that's it. Five specific goals for 2010. Wish me luck! The best part? Each dish will allow for plenty of leftovers, meaning many nights of meals with minimal work. Well, eat hearty. We are expecting snow again tonight. I would welcome another snow day tomorrow. The baby likes to sleep in a little. That's to be expected when you get up two-three times per night. 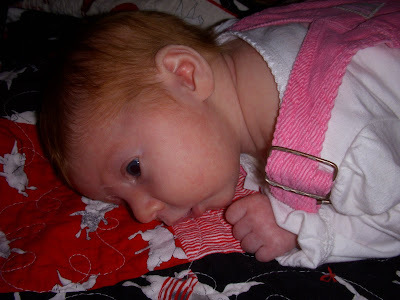 And speaking of baby, I am changing her blog name. Henceforth she shall be known as Ginger. I made little notebooks for the girls for Christmas. I had made one for myself, and they liked to steal it, especially during church. Flower finally got to open her Christmas presents last night, so now I can show pictures of what I made. Must go -- Ginger cries. Today, our good friend came over to visit Little Red. His name is Eric. He plays the piano and organ beautifully, and can sing as well. He also has a soft spot for little girls. 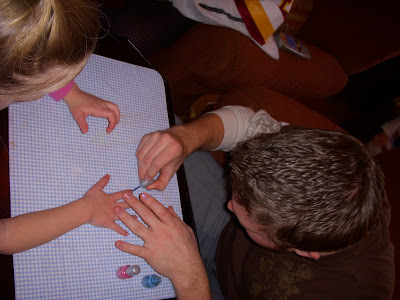 Mini-me convinced him to paint her nails. It wasn't that hard. Did I mention he's single? Oh yes ladies, he is single. Lest we think we have found the perfect man, when Mini-me asked him to paint her toes, Eric wrinkled his nose and firmly denied her request. He still needs a little work. At our New Year's Eve celebration, Patch excitedly came up to me and announced that he was going on a fishing trip. His cousin, 3 year old Abby Cadabby, joined in. Patch: I am going fishing! I am going to catch a crap. Abby Cadabby: Yeah! And I am going to catch a poo-poo fish! GrandPatty and I were a little stunned by this potty talk. Luckily when my kids were born, I was given a mom-translator at the hospital. Me: Oh! You are going to catch a crab? Me: And you're going to catch a purple fish? AC: Yeah! A poo-poo fish! Happy New Year's to you! May 2010 be a year to clear up all misunderstandings.